Discussion in 'WWII Online' started by O'Donovan, Mar 8, 2017. For a number of years, Battleground Europe: World War II Online (WWIIOL) barely stayed afloat. If not for the dedication of its players, it would have folded. Instead, the players stepped up, took over the development studio (Cornered Rat Software), obtained badly needed funding, and started bringing the game back to life. WWIIOL was the first MMOFPS (Guinness World Record holder). It was started on D-Day (June sixth) of 2001, so it's coming up on its 16th birthday. (And yes, there are still quite a few "day one" players playing the game every day.) It's run on a single half-scale map of Europe. That's ONE map with no instancing, still the largest computer game map in the world (Guinness World Record holder). It's a 24/7, campaign-based, combined arms sim. The German forces (representing the Axis) face off against the British and French (representing the Allies). If the campaign goes long enough, the Americans join the fight on the Allied side. A campaign runs for a few weeks to a few months, until one side wins. Then, after a couple days of intermission, war breaks out again. You can play as an infantry soldier or spawn in an armor, naval, or air unit. Except for a few computer controlled (AI) defensive gun emplacements around towns and air bases, everyone and every vehicle you fight is controlled by a live player. Warning, the game has a steep learning curve. It's definitely for the serious sim-head. If you play it like it was a console game, you will get your avatar killed. Tactics and cooperation are EVERYTHING. This IS a true simulation. The physics (including flight) and damage models are as absolutely realistic as they can be. NO "hit points," either! And no pay to win. There are NO microtransactions, so no one can out spend you to get a better engine, better gunnery, better armor, et cetera. Yes, the graphics are somewhat primitive. That will be changing, however. The Rats (developers) are already doing new models for some of the equipment ingame, and are working on updating everything over time, as resources allow. HOWEVER, those same primitive graphics mean you don't have to have a high end gaming computer to play, since there may be THOUSANDS of players in the same area of the map as you. There are also new items being brought ingame all the time. Among the latest are PPOs (player placed objects) and FMS (fortified mobile spawn points). Soon, new variants of existing planes will be brought in, giving us "tank buster" aircraft. If you're a ground pounder, don't fret. Also coming in will be mobile (tank or halftrack mounted) anti aircraft guns. NOTE: The tank busters and mobile AA are "place holders," made by modifying existing ingame assets, for use until historically correct units can be modeled and brought into game to perform those same tasks. The basic (low tier) game is free to play. If you decide you like it, you can "enlist" with a Starter subscription for $4.99(US)/month, which gives you access to some higher rank and better equipment. Or, you can get a Premium subscription for $14.99(US)/month, which gives you access to all ranks and equipment. I was paying $14.99/month back in 2003 for the Istaria MMO and after that for City of Heroes, so that's NOT a bad deal. For less than you would spend for a movie ticket, Coke, and popcorn, you get a full month of 24/7 WWII action. As I said earlier, the game is being improved constantly. The Rats have cleaned up a TON of old, poorly patched "spaghetti code" and have purchased new hardware. The game is moving forward. In fact, the game is scheduled to be released on Steam (game service) later this year. Now's the time to get ingame. Just so you know, I have NO connection to the developers. I'm simply a player and a big fan of the game. I'm posting this in hopes that others will discover and come to love this awesome (and incredibly frustrating) game. BTW... GO ALLIED! The Axis players dress funny and smell like bratwurst and sauerkraut! lwd, CAC and Otto like this. Certainly sounds like it's worth a look from your write up. It's a good game, once you learn how to play it, which will take a while, but they are working on simplifying it a little. It's not as up to date as most games graphics wise but game play far exceeds anything iv'e ever played, The one game I always keep going back to, was a bit stagnant a few years ago development wise, but things starting to pick up. I played WWIIOL a few times about a decade ago, it gives a player the ability to play against other live players which is always better than any AI opponent. The scope of the game encompasses all of Europe, which is impressive. I recall liking it but time didn't allow me to get too deep. Everyone likes graphics, but gameplay is king. Combat Mission is a good example of this, the early games were stellar and modern versions just never matched the previous playability or engagement despite looking much better. KJ Jr and CAC like this. Good to see the interest, here! 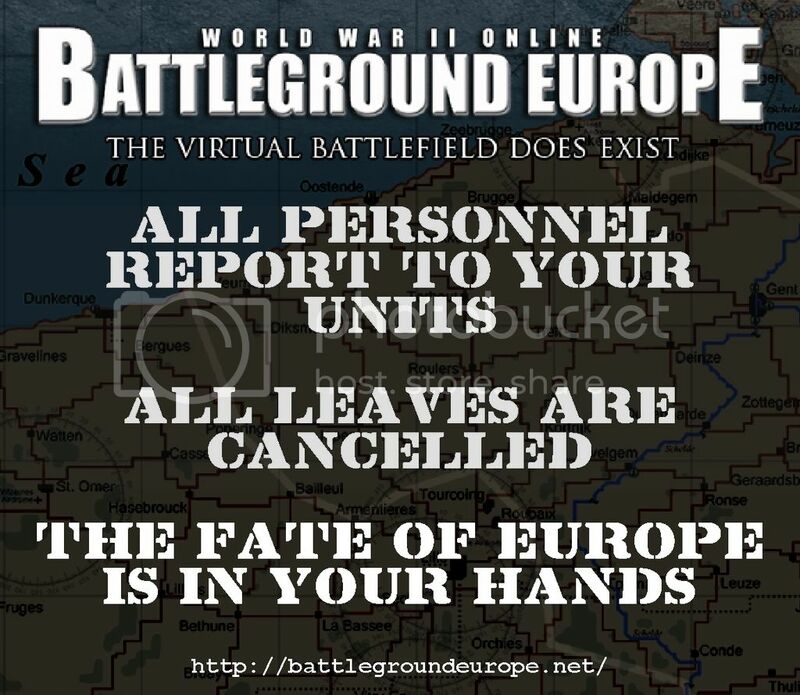 I invite everyone to create an account and get on the forums at battlegroundeurope.net (under the Community & News tab, at the top). There are some forums locked to Premium members, but several of the forums are open to FtP accounts. Get some info, make some connections, watch some tutorial videos, and get ingame. WWIIOL currently uses Discord for ingame voice chat. The Rats are working on integrating a fully ingame VOIP function, at some point (hopefully soon), however. Whether or not you have Discord, text chat is also your friend, BIG TIME. The side which communicates best is the successful side. I do play the odd online wargame from time to time, and I'd like to give it a try but I'll have to file bookmark this thread and check back in later in the year when I've got a handle on the site software. I agree completely. While the new versions are quite pleasing to the eye, they sacrifice much. Historical accuracy and engrossing effect is paramount to my enjoyment. It's no secret that I'm a big fan of the Close Combat series and the early Call of Duty (CoD Classic and #2). The online multiplayer was very satisfying. Every now and then I can find a game with another nostalgic fan, lol. I have tried WW2 online and it was up to par with the spirit of WW2 gaming when it was in its heyday. I have played a few stints of it, but just don't have the time to consistently play or make it worth the monthly-fee. Too many other games. Otto makes a good point about Combat Mission - Beyond Overlord, Barb-to-Berlin, Afrika Korps - all brilliant games. Their successors...not so much. Visually pleasing but making them real-time and changed the play too much. Could never get into them. Still play CMBB on occasion. Totally agree with you guys. I enjoy some early version Combat Mission, the newer stuff is shiny, but gameplay is much less dynamic. The current maps are also much smaller in size and don't allow for the mass assaults and multiple smaller actions that the older versions so often offered. Wait there is a monthly subscription for WWIIOL? I can't say that's something I'm a fan of, how much is it? According to website, $15 a month for full access to the game. Seems like a consensus on Combat Mission old vs new. And for anyone who wants a mauling in any older version of Combat Mission, OMA is your man. He's blasted me off the map a few times. It seems so, but how many people go to the movies, in the evening (non-matinee), at least once per month? In the US, an average ticket is over $8. Add a soft drink and a popcorn to that and you've spent more for a couple hours than you spend for the entire month of gaming. A study done last year shows about 20% of gamers spend between $101 and $250 per year, and about 23% spend over $250, on microtransactions in at least one game. From what I see, as a player, there are a LOT of gamers spending hundreds of dollars per year on each of multiple games. I'd like to see the stats on games such as World of Warplanes, World of Tanks, and War Thunder, where you almost HAVE to spend RL cash or spend hours grinding, to get decent equipment. By the way, every so often, to herald the release of a special update, the Rats run a "Welcome Back Soldier" (WBS) promotion, where they reactivate all old accounts as well as boosting all FtP and Starter accounts. Everyone is at Premium level access for the duration of WBS. The last couple times they did that, they also made a special offer. Anyone signing up for a Premium account (or upgrading an existing FtP or Starter account to Premium) could get it for $10/month, permanently. As long as the account doesn't lapse, it stays that price. I play War Thunder and haven't spent a dime on it. Spending $$ does give you boosters and things, but the 'premium' content is minimal (1 - 3 premim vehicles in a tier, vs 12 or so free ones) and doesn't give an advantage. I can't tell you how many times I've killed premium/paid-for vehicles and can't remember ever being killed by one. I can pick the game up whenever I like as its free and don't have to commit time per month to it. Going to the movies is easy and you're paying for a service and experience. I either go or I don't go, I don't feel like I have to commit myself to it and I go rather infrequently. There is no 'punishment' for not going for a few months either. I have done microtransactions in other games, but for only about $10 - 20, a one time payment, which is still about $100 shorter than a years memebership to WW2OL (factoring in the $60 for the game as well). I've never been able to commit to an MMO. If the money didn't matter than yeah, maybe I'd (re)sign-up, but money does matter to me and I can't afford $15-a-month for a subscription I wouldn't get my $15 out of each month. Well, that's you. That has absolutely NO bearing on anyone else's habits or experience. I've read forums where some of the contributors admit to already having spent over $500 on a game which had just come out within the past year. YMMV (your mileage may vary). Every game is not for everyone. The basic idea is that, for less than the price of a night at the movies, you can play a full month of this intense, addictive, WWII PvP game. The basic idea is that, for less than the price of a night at the movies, you can play a full month of this intense, addictive, WWII PvP game. Lol. Yeah you didn't get my sarcastic meaning. Yeah, I did. Think about it. What type of movie theaters are well known for "physical contact?" Lol. Still no. However I got a good chuckle out of that one and I definitely see how you got there, lol. What I meant by "having human contact" was getting out of the house and not playing computer games. Tongue planted in cheek. Lol. Good old text.